Initially, this blog was simply to document the lives of my kids for those far away to read and feel close. In the last year or so, I've broadened the scope to include my thoughts and tips on being a mommy. I'm now broadening the scope further to include thoughts and tips on the job that pretty much goes hand in hand with being a mom; home maker. You may have an additional job on top of these two, and quite possibly your husband helps run the house. Still, it's a big job, and I think it's one that all of us struggle to balance with our other roles. So think of blog posts that start with "What a girl needs" as my version of Oprah's favorite things. They will most likely be things that are helpful with raising kids or making a home, but, hey, maybe I'll throw in some things that don't apply to either. Today, though, I'm telling everyone out there why you need "Everyday" china dinnerware. A few of my friends have registered for fine, occasion china when they were getting married, but I don't know anybody besides myself who registered for everyday china. Instead, all my friends have what I think most of us consider as more casual, more durable, more economical ceramic plates. Let me tell you why I don't believe any of these apply. My mother-in-law had a set of everyday china that she just retired after 35+ years of use. When I got married she convinced me that china was the way to go. 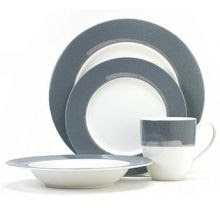 I registered for Noritake Ambience dinnerware in Charcoal. They are dishwasher, microwave, refrigerator, and even freezer safe. In the last 7 years of almost continual, daily use (sans the 6 months we lived with our in-laws), not one plate, saucer, bowl, or mug has cracked, chipped, or broken. The other day, one of my smaller plates fell on the floor due to some mishap involving the laptop cord and our dog. I thought for sure that I would have to go searching on one of those retired china warehouse websites, but, no, the plate remained intact. So let me ask you, are your ceramic plates in pristine condition after that much time? China plates are not the delicate things we think about bringing out every year when we host Thanksgiving (and let's be honest, how many of us young moms host holidays on a yearly basis? ), these are like the diamonds we where on our fingers that are continually exposed to dishwater and diapers; they can stand the test of life. So unless you're afraid that you'll get sick of the same pattern after so many years, my suggestion is to invest (or register if not already married) for a set of "everyday" china. When are you and your sister due? Do you get ultrasounds to find out what you guys are having? Glad to know I have some wisdom in the practical things. :) On the 29th those plates will be 38 years old. I really haven't retired all of them but they are slowly decreasing and the color has faded some. Glad yours are doing so well . Think about it I think my place setting was around 20 each --maybe less . Divide that by 37 and they have been very cost effective.